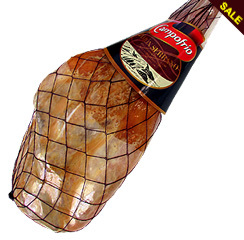 Serrano Ham is a special product of mild salty flavor and delicious. 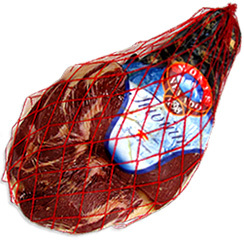 Serrano Ham is considered one of the finest Spanish hams for its quality and unique taste. Serrano Ham has a uniform and homogeneous configuration, slightly fibrous texture has a delicate, slightly salty and pleasant smell. 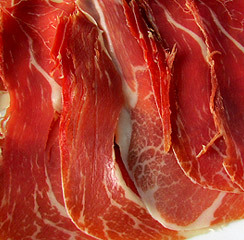 Especially due to the unique properties present in its fats, Serrano Ham is a heart-healthy food par excellence. Serrano Ham is one of the best Spanish hams that can be found in the U.S. Serrano Ham comes from the white pig, raised and fed on natural environment, which makes this product a delicacy on the palate. 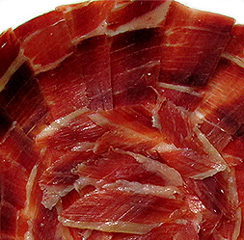 Serrano Ham is considered one of the best in the world for its aroma and deep red flesh. 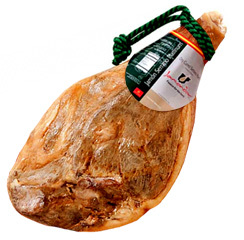 Serrano Ham contains healthy unsaturated fatty acids and oleic acid. 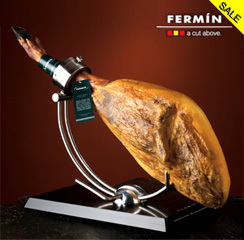 Serrano shoulder Fermín is the best in quality and exquisiteness. It has no comparison in taste and smell. This time you can get it boneless and vacuum packed. 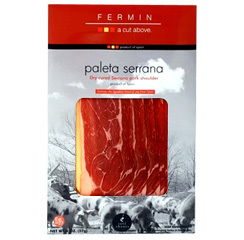 Serrano shoulder Fermín is made from the selection of the finest pork meat from La Alberca, Salamanca, Spain, with a minimum curing period of 18 months and using traditional methods. It is a genuine product of the Spanish gastronomy. Serrano shoulder Fermín has awarded its own seal of quality. Moreover, it is obtained from the fatty Serrano pork, which is fed naturally and has great nutritional and sensitive qualities. 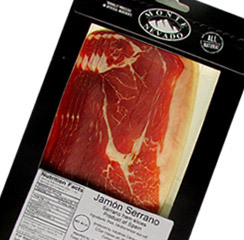 Serrano Ham Monte Nevado Boneless Cut into 4 pieces is a special product and easy to use for the consumer, vacuum packed, each piece individually packed in one package. 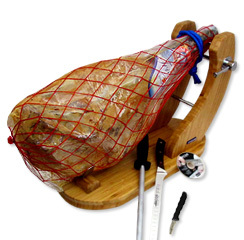 It is a convenient option for home consumption, the package, which consists of 4 pieces of boneless and ready to cut ham, ideal for those who do not have good skills in the art of cutting the ham, or lack the time to properly cut a whole ham, is an affordable and practical option. 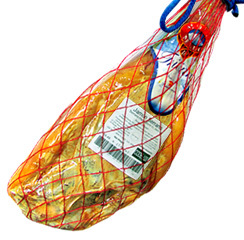 This boneless ham is made from the hind legs of white pigs, which has excellent qualities for making slow curing serrano hams in natural drying, for over a year. The piece has the bone removed and is kept under the strict supervision of the ham master, to get the best results. 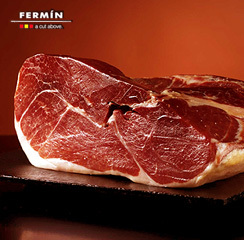 Serrano shoulder Fermín is the best in quality and exquisiteness. It has no comparison in taste and smell. This time you can get it boneless and vacuum packed. Serrano shoulder Fermín is made from the selection of the finest pork meat from La Alberca, Salamanca, Spain, with a minimum curing period of 18 months and using traditional methods. It is a genuine product of the Spanish gastronomy, as well as demanded for its fibrous and soft meat. Serrano shoulder Fermín has awarded its own seal of quality since it is salted, cured and dried in the heart of the Sierra. Moreover, it is obtained from the fatty Serrano pork, which is fed naturally and has great nutritional and sensitive qualities. 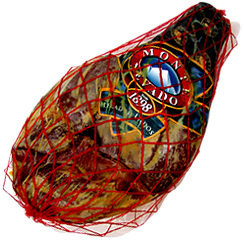 Serrano Ham Monte Nevado a slow and controlled curing process is used. Serrano Ham Monte Nevado Boneless cut into pieces (one piece) is a special vacuum packed product, this package of a quarter of a whole ham is a convenient option for consumers when they are few people at home, a superb offer of a piece of boneless ham ready to cut, ideal for those with little time and with poor skills in the art of cutting a ham. This Serrano Ham Monte Nevado Boneless cut into pieces is the result of cutting a whole ham into 4 pieces of equal weight. It is a ham of a long and careful curing, with a smooth taste and aroma, low in salt, and with a characteristic aroma and flavor reminiscent of the hams that were once manufactured in Liedos. 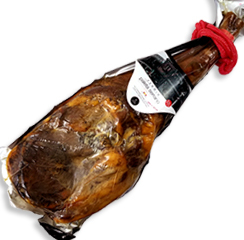 Serrano Ham Monte Nevado is an exquisite Spanish Serrano Ham of traditional and emblematic flavor made with the best raw materials, ideals for the production of cured hams of the highest quality. 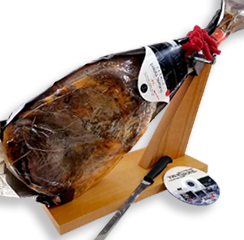 This exquisite Serrano Ham remains in a prolonged stay in the cellar, which allows Serrano Ham Monte Nevado acquire its characteristic aroma and flavor. 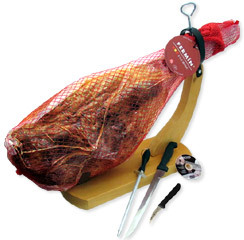 Serrano Ham Hand Cut is a ham that keeps its flavor at all times. It comes from the ham with bone and its cut, made by master cutters, offers us a thin slice, keeping the fat in the product. With this new type of Serrano Ham Hand Cut you can have, in a single package, different parts of the Serrano Ham (the thicker part, the thinner part, the tip, the stifle) so that you can taste different parts in one envelope, packaged and vacuum sealed to preserve the freshness of the product. The hand cut of this product is made by professional ham cutters. Hand cutting is preferred because this way the ham’s properties and flavor are better preserved. That’s not so when the ham is machine cut since the heat of the machine blade takes a lot of the original flavor of the ham. Moreover, the size of the slices manually cut with a knife is the right one for a better tasting. With uniform and homogeneous configuration and slightly fibrous texture, this ham has a delicate, slightly salty taste and a pleasant and characteristic smell. These features make the Serrano Ham Fermin a heart-healthy food par excellence. 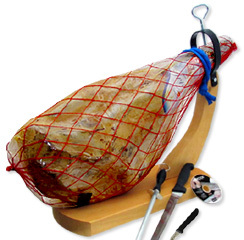 The careful selection of the mountain pigs is essential for a quality product and unique taste as the Serrano Ham Fermín has. Particularly important are the special properties of their fats. Serrano Ham Fermín comes from the white pig, raised and fed on natural environment, which makes this product a delicacy on the palate. 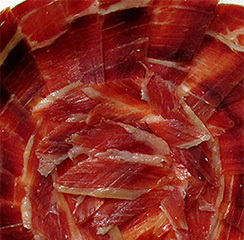 The Serrano Ham Fermín is considered one of the finest products for its quality and unique taste. With uniform and homogeneous configuration and slightly fibrous texture. 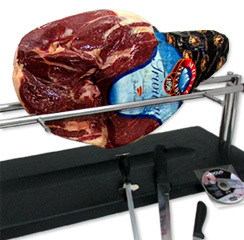 The Serrano Ham machine cut comes from the Serrano Boneless Hams. This is a good option to taste the Serrano Ham without investing too much money. Also, with the option to purchase the Serrano Ham already cut the customer does not have to cut it by himself. 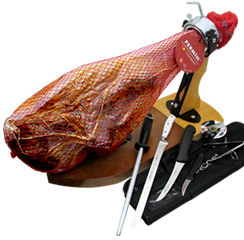 The Serrano Ham machine cut by a master slicer combines different parts of the ham. It is presented in a package of one pound, vacuum packed and sealed for better conservation and freshness to consume. 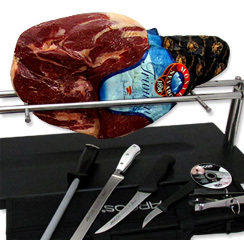 With this option you can have a Serrano Ham machine cut by a master slicer in small portions. Vacuum packaged, the product is sent through the postal service "Second Day" so it is always fresh and fully guaranteed. The Serrano Ham Monte Nevado comes from the hind legs of white layer pigs, which have the highest levels of fat and excellent qualities for the preparation of the Serrano Ham of slow curing. These pigs basically fed with cereal fodders. 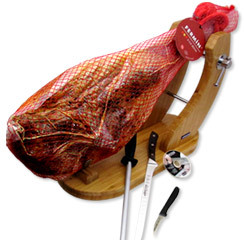 The Serrano Ham machine cut comes from the Serrano Ham bone-in, a piece that retains the properties and tastes. Once cut the slices of ham, they are packaged immediately to avoid losing any of its properties. This choice of Serrano Ham machine cut is very handy to have at home for opening it when appropriate. It is important to properly savor a slice of Serrano Ham machine cut to remove the case from the refrigerator in advance and let it stand at room temperature. During this time the ham can sweat, what is a good sign to taste the product with its flavor at its peak. 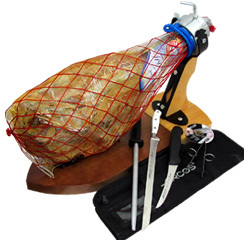 If you do not feel like buying a whole Serrano Ham piece, with this option you can have a Serrano Ham machine cut by a master slicer in small portions. Vacuum packaged, the product is sent through the postal service "Second Day" so it is always fresh and fully guaranteed. 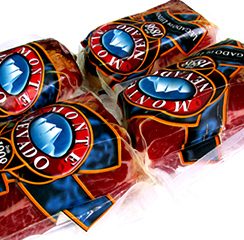 The Serrano Ham Monte Nevado Sliced is a food of amazing quality, easy to cut, and considered one of the most popular dishes of the Spanish cuisine. With a high nutritional value, the Serrano Ham meat is substantially free of fatty acids, making it an excellent dietary product. 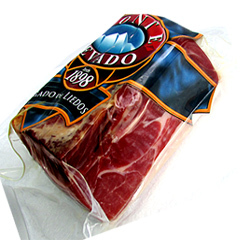 The Serrano Ham Monte Nevado Boneless is a real delicacy, made with the best raw materials, which are ideal for making cured products of the highest quality. This exquisite product, the Serrano Ham Monte Nevado Boneless, is kept in a prolonged stay in the cellar, which allows it to acquire a characteristic aroma and flavor, preserving the parameters of temperature, humidity, and hygiene controlled in all the processes. 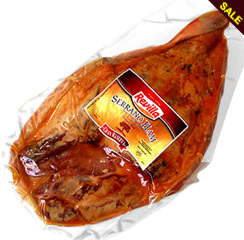 Serrano Ham Revilla Boneless is a fine quality ham, the result of a long curing where a product of mild flavor and aroma is obtained. 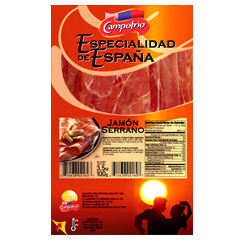 Made after a rigorous selection of raw materials, we offer you a piece of boneless serrano ham with full fat and skin. Ideal for slicing into thin slices and enjoy in tapas and sandwiches. A product that comes from a pioneer brand in the field of processed meat: Revilla, trusted brand in the Spanish market, is considered a hallmark which combine tradition and authenticity. 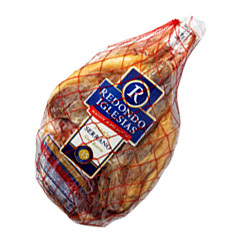 With over 40 years of experience, Revilla brand offers a serrano boneless ham that will satisfy the most demanding consumers. 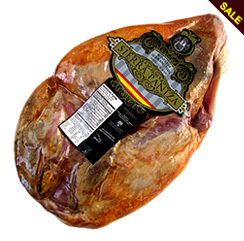 Serrano Ham Sierra Paniza Boneless is known by the quality of its meat, delicious taste and texture. From Teruel region, in a privileged spot for the curing process of between 12 and 14 months, hams can get the highest quality, from selected breeds on a natural diet. 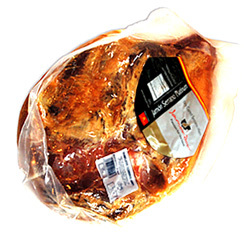 The cold, dry climate of the highlands of the province of Teruel allows the making of a Serrano Ham Sierra Paniza Boneless of the highest quality, of low calorific value, recommended for all types of diets as a safe and healthy product. Serrano Ham Sierra Paniza Boneless from Teruel region is known for its long and shaped form, it is bright reddish when cut. Not too salty with fat infiltration in muscle mass, it is a very tasty and irresistible dish. 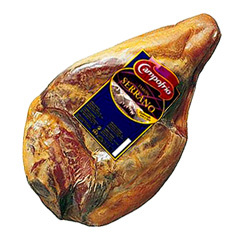 Serrano shoulder Fermín Boneless is the best in quality and exquisiteness. It has no comparison in taste and smell. This time you can get it boneless and vacuum packed. 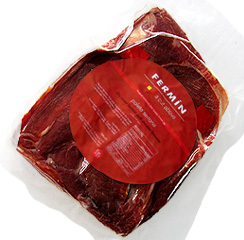 Serrano shoulder Fermín Boneless is made from the selection of the finest pork meat from La Alberca, Salamanca, Spain, with a minimum curing period of 18 months and using traditional methods. It is a genuine product of the Spanish gastronomy, as well as demanded for its fibrous and soft meat. Serrano shoulder Fermín Boneless has awarded its own seal of quality since it is salted, cured and dried in the heart of the Sierra. Moreover, it is obtained from the fatty Serrano pork, which is fed naturally and has great nutritional and sensitive qualities. 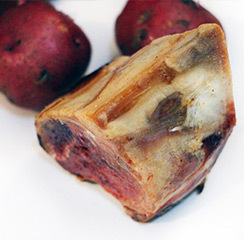 Bones from Serrano ham are considered in some cuisines, such as Spanish as a culinary ingredient. The bones of Serrano ham are used in various cooked. Participates in Madrid cooked, lentils with ham, on the Asturian bean stew in Murcia michirones, to make soups, lentils, Caldo Gallego, Pucheros, even for ham croquettes. Now you can prepare your soup to taste with bone Serrano ham and you will see that you will enhance your dishes with a very special flavor. Very important: we, at Ham Cheese Wine, we cut the bones of Serrano ham at the time you order it and the bones cut come from our own carved hams, never freeze the bones to not lose the aroma and flavor.